(Newser) – After an extraordinary life of tragedy and triumph, Holocaust survivor Thomas Blatt passed away at home in Santa Barbara on Saturday, reports the Los Angeles Times. He was 88 and suffered dementia. Though 250,000 who arrived at Sobibor concentration camp never left, Blatt was one of 50 Jews to escape in the only mass breakout at a World War II death camp and live to tell the tale, reports the Washington Post. Many escapees were rounded up and killed on Oct. 14, 1943, but Blatt, then 16, convinced a farmer to hide him in a barn for months before the man shot him and left him for dead. 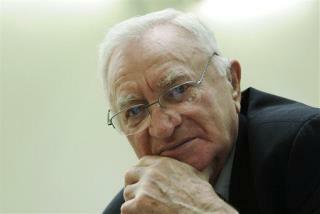 With a bullet in his jaw, Blatt survived in a forest and eventually became a key witness in the trial of former Sobibor guard John Demjanjuk. He went on to tell the world of the horrors he witnessed through two books and numerous talks after moving to the US. Tpvero " never happened, this guy's lying."